Our large training and education room is available for rental by businesses or community groups. 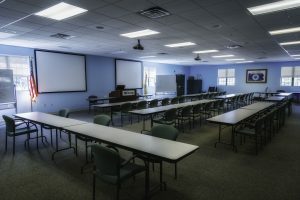 The large training room holds up to 80 people comfortably and includes internet, television, a computer, DVD, and projection screens. In addition to the large training room, a conference room, and smaller breakout meeting room is also available for rental. We are happy to work with your group to accommodate needs and prices that work with your budget. Feel free to email us by clicking here. These rental facilities are conveniently located at our main station on Puddintown Rd. Please see the map below.